Gone with the Goods and Services Tax (GST) are inflation worries. This could be a loud statement about Malaysia’s just-released consumer price data for June. We revise our full-year 2018 inflation forecast from 1.8% to 1.0%. Lower inflation will allow a greater scope for the central bank (Bank Negara Malaysia) to keep the monetary policy stable for a prolonged period, or even ease in the event the global trade war adversely impacts the economy. In a huge downside surprise, CPI inflation slowed to 0.8% year-on-year in June from 1.8% in the previous month. The consensus was centered on 1.3%. A sharp slowdown was mainly the result of the cut in the GST rate from six to zero percent effective June 1 by the new government. 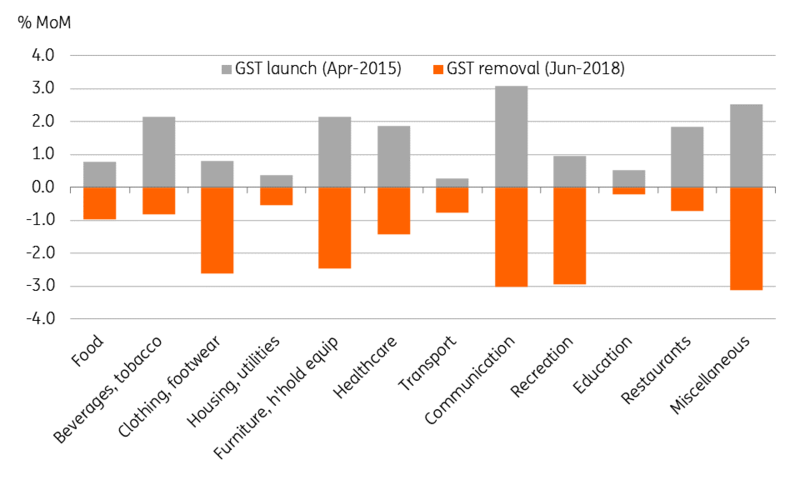 The effect is clear from the month-on-month price changes across CPI components, almost mirroring the impact upon the introduction of GST in April 2015 (see figure). The year-to-date inflation of 1.6% YoY has more than halved from 4% a year ago, led by a steep slowdown in key components of food and the transport prices. The GST will be replaced by a less severe Sales and Services Tax (reportedly by September), and any impact is likely to be transitory without significantly reversing the ongoing inflation downtrend. We now see inflation remaining well below 1% in the remainder of the year, or possibly even turning negative as the central bank has pointed out in the latest policy statement. This prompts another downgrade to our full-year 2018 forecast from 1.8% to 1.0%, the second since May when we cut it from 2.4%.